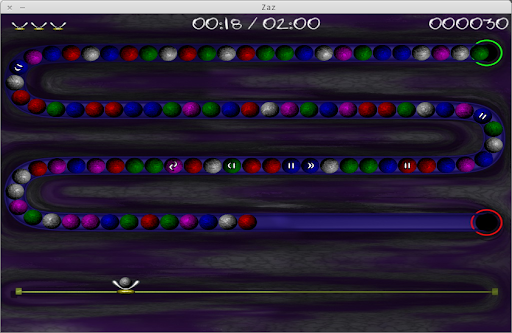 Zaz is a multi-platform (Windows and Linux) arcade action puzzle game where the objective is to get rid of all incoming balls by rearranging their order. The idea of the game is loosely based on games like Luxor, Zuma and Puzzle Bobble. Zaz 0.8.0 was released a few days ago, the new version extending the number of levels to 20, added language option in options menu and some other small improvements. The version in Ubuntu is still 0.2.9 in both Lucid and Maverick, so we've uploaded the latest Zaz 0.8.0 in the WebUpd8 PPA, so there are many new levels and features compared to the version in the Ubuntu official repositories. If you don't want to add the WebUpd8 PPA, you can also manually download the .deb files.